It seems as though NOSHology, conceptualized as a place where friends and family can "virtually" join me at the table for a delicious meal, or perhaps in the kitchen for an experiment in cooking, or maybe in the theatre for a screening of a food-related film, is turning into an online memorial of sorts for eateries long since shuttered, including Katsu Burger (thankfully re-opened), La Bête, and Frog N Snail. Either I have very esoteric tastes or the restaurant industry is more transient than I once thought it to be. Regardless, let us take a moment to "pour one out" for Hot Doug's. This Avondale homage to encased meats led hungry patron after hungry patron to willingly wait in line for hours for a chance to wrap their lips around gourmet sausages created in-house by wildly popular charcuterie czar, Doug Sohn. Some went so far as to tattoo themselves to proclaim their love for Sohn and his creations. 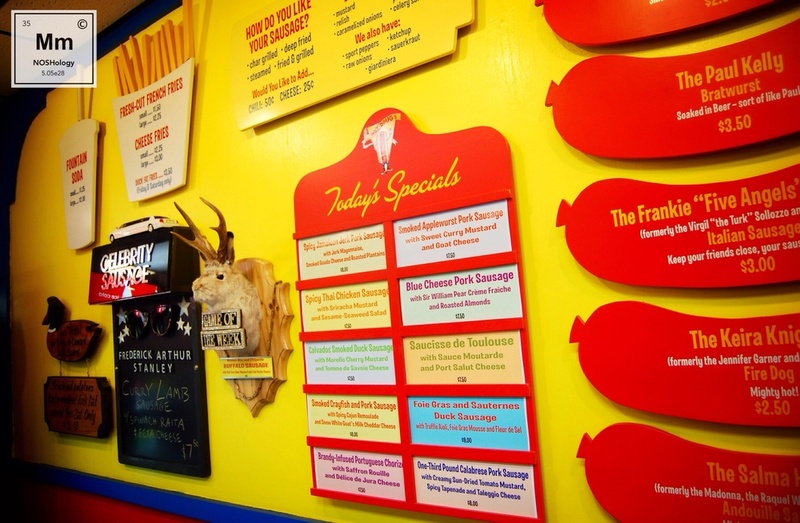 The regular menu at Hot Doug's was filled with affordable and tasty staples with periodically-changing names based on current pop culture and references to Chicago's history and people, with multiple gourmet options on rotation detailed on the Today's Specials board. You even got to choose how your sausage was prepared: steamed, grilled, deep fried, or fried AND grilled. I'll never forget the summer of 2008 when my friend Lindsey and I were rewarded for our patience with an antelope sausage with blackberry crème fraîche and goat cheese. We also enjoyed a smoked debreziner with bacon-garlic mayonnaise and smoked gouda and a traditional Chicago Dog. For all you newbies out there, that means an all-beef frankfurter on a poppy seed bun with mustard (NO KETCHUP! ), raw chopped onion, toxic-sludge-green sweet pickle relish, a tart dill pickle spear, slices of tomato, pickled sport peppers, and a pinch of celery salt. It's no surprise that when I was planning my week-long celebration of finally completing my PhD, Hot Doug's was one of the stops on my food tour of Chicago. Hey look! My double chin is so adorably pinchable! Say what you will about the recent rise of the lumbersexual, but I must endorse the effectiveness of my current beard on downplaying my pudge. When my mother and Uncle Rob rolled into Hot Doug's, we picked up some Chicago Dogs, duck fat fries (available on Friday & Saturday only) and an über-rich foie gras and sauternes duck sausage with truffle aioli, foie gras mousse, and sel gris. Yeah, I know how foie gras is made. You don't have to tell me. No, I'd never had it before, and I've not had it since. I ate it purely out of spite. Ain't no city council gonna tell me what I can and cannot eat. Little did I know, this visit would be the last I would ever make to Hot Doug's. In May of 2014, Sohn announced that he would be closing his iconic restaurant forever. Unlike the other NOSHology entries for now-defunct eateries, this one has a self-directed and happy ending...at least for the chef/owner, if not for the general public: Sohn simply wanted to direct his creative energy toward something else. Coverage from the local news media on the day of Doug's announcement and leading up to his last day on October 3rd, 2014, reflects the love and appreciation Chicagoans and out-of-towners have for Sohn and his work. Fare thee well, Emperor of Encased Meats. Buy Hot Doug's: The Book here. It doesn't taste as good as the real deal, but it's all we have left.